I have always been fascinated by lonely, old and forgotten places which have many tracks and stories to tell. (See some examples of my previous watercolors here below). Now we have located some favorite spots in Tuscany which we will visit and where we will paint on spot. The guest teacher will be the talented & multifaceted swedish artist and professional urban sketcher Anders Mohlin from Stockholm. 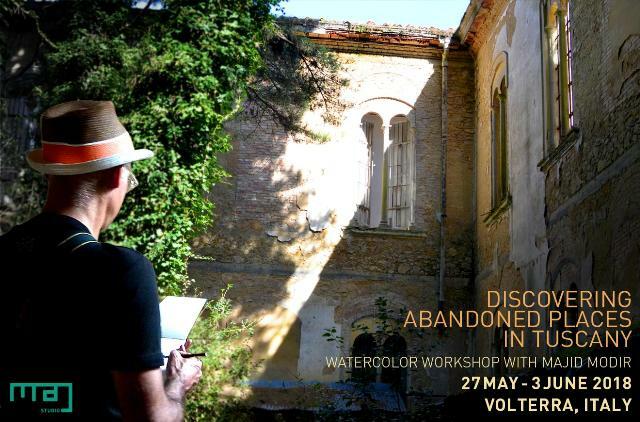 Place: The workshop will be in held the beautiful Villa Guadalupe in Volterra, as the working base and also as the accommodation for a limited number of participants. Daily activity: 5 days of instructions, trips to the locations, reviews, and a final public exhibition of the works in Volterra.